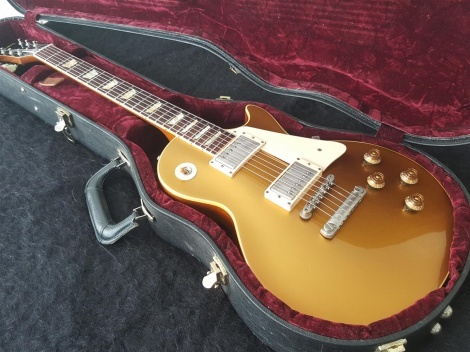 Gibson 2004 Les Paul Historic 57 Reissue - Gold Top. This authentic Gibson 57R is a used guitar and in excellent condition for its age, well looked after and cared for. There are some marks, dings and buckle rash you would expect from a 15 year old used guitar. It plays amazing. It is in perfect working order. The Burstbuckers are thick, smooth and rich with sustain to die for. The tone sends shivers. This is the real deal, one of the best guitars on the planet IMHO. This '57 Reissue has a "gloss" finish. The guitar has no aging done to it by the factory, other than what has naturally occurred during the last 15 years. Retail for a brand new 57R is $8999. Solid body with Maple top, no weight relief. The thick neck is comfortable whilst beefy, great to wrap those barre chords around for full and beautiful clarity and sustain. The binding has yellowed with maturity. The gold colour is the deep bullion gold. The Rosewood fingerboard is dark with a stunning red tinge in the right light. Very little wear on the board or the frets. It has had a professional set up and plays beautifully. Period correct neck, tuners, pickguard, and trussrod cover. Holly headstock veneer. Burstbucker 1 & 2 p'ups. Also includes the Certificate of Authenticity. Guitars Rock - NZ's On Line Guitar Shop selling quality instruments to discerning NZ musicians at a fair price.